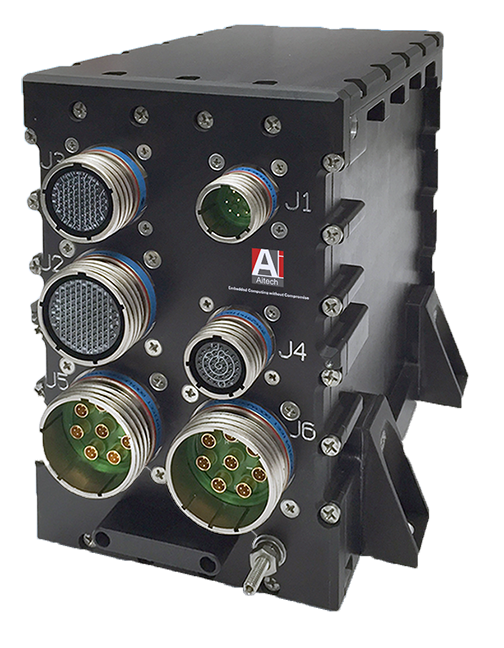 Aitech Defense Systems Inc. now offers a cold plate cooled, space-rated enclosure for use in mission-critical, space applications. A fully-customizable front panel easily accommodates any user-specific I/O requirements. A PWB-based I/O transition module eliminates intermediate wires and harnesses for more reliable connections and less system integration challenges. The cold plate cooled E905 channels heat to specially designed side walls, enabling dissipation of more than 65 W, even when the unit houses up to three 3U CompactPCI boards, from SBCs, graphics and video cards to GbE switches or other I/O cards, and a modular 3U power supply. A removable 3U power supply, with an input range of 20 VDC to 36 VDC, provides continuous high current, high efficiency operation. Tested to withstand the most adverse spacecraft conditions, this power supply is latch-up immune to >37 MeV*cm2/mg and withstands a total ionization dose (TID) of >25 krad(Si), with an efficiency of more than 8 percent. Standard total output is 140 W or, optionally, 150 W using an Aitech P230 power supply. Complete EMI/RFI power line filtering via a Faraday cage shields both output and input from high voltage spike transients and noise. The filtering also provides the outputs with protection from short circuits, thermal breakdown and overshoot, while inputs withstand reverse polarity via the chassis. Mean time between failure (MTBF) at 50°C is >693,088 hours for space flight and >115,000 hours for missile launch. Weighing less than 9 lbs. unpopulated, the new E905 is designed for optimum SWaP and measures only 7.60" x 6.65" x 7.70" (L x W x H) with mounting flanges. The unit’s width drops to 4.88" without the mounting flanges.